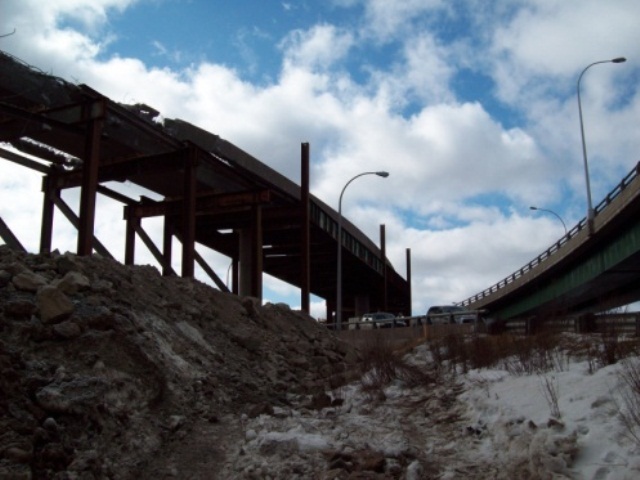 This project entailed the detailed demolition design of a post-tensioned concrete box structure in the North end of Halifax adjacent to the MacKay Bridge (one of the two large suspension bridges crossing Halifax Harbour). The Ramp 9 structure was a 7 span, 175 m long, post-tensioned, voided box girder structure supported by cast-in-place concrete piers and abutments founded on spread footings. Sections of the bridge (span 1 and 2) incorporate horizontal curvature into the alignment of the bridge. The existing bridge was designed/constructed in the late 1960’s-early 1970’s and had been taken out of commission some time ago by the Halifax Regional Municipality. The road network in the urban setting consists of a network of roads and bridges surrounding and underneath of the structure. 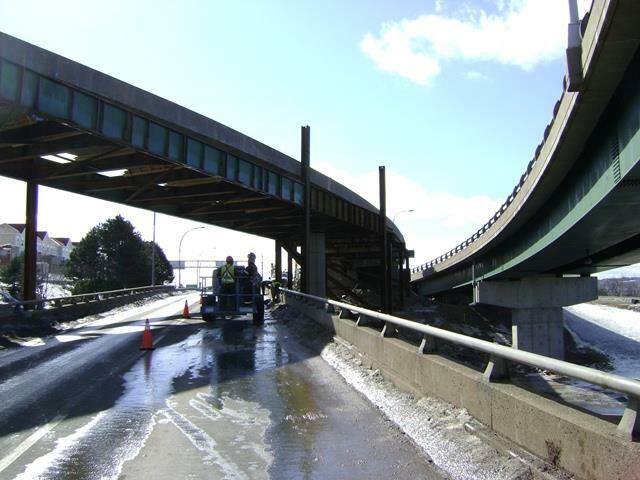 HEC developed two systems to demolish the structure: one for the portion over unused land that involved braced pile bents to support the structure during demo from the ground, and one for the spans crossing over the roads and bridges below. For the latter more complex area of the demolition, a steel grillage system (thru-girders and floorbeams) was designed that could be erected during a single weekend closure and maintain the required clearance box to the road / bridges below. The following weekend, with an excavator, complete with breaker, mounted on the concrete structure and supported by the steel grillage, the span was demolished with the debris captured below in bins (4” minus pieces). The grillage was designed to support the girder segment and excavator during demolition. The road closure was allotted from late Friday evening to early Monday morning, with the demolition being completed by early Sunday evening complete with the debris and grillage removed. No damage was incurred to any infrastructure below or surrounding the structure during the demolition operations. As part of a demolition contract of the structure, the contractor (Dexter Construction) wished to install some temporary works from the deck of the bridge because of the congested area of an existing structure below the Ramp 9 structure as well as a third level road below combined with steep sloping grades in the area. Specifically, the contractor wanted to install steel H-piles using a 45 ton crane from on top of the bridge. The combined weight of the crane and vibratory hammer exceeded the design live load of the bridge (HS-20 loading). Harbourside Engineering Consultants, in addition to completing the engineered demolition design, conducted an overload review including a full structural analysis of the structure (accounting for the torsion induced by the horizontal curvature), a review/evaluation of the present condition of the bridge, and a load test on the first 4 spans where steel frames were installed below in the case of distress in the girder or excessive deflections. Recommendations regarding the operations of the crane and its position of the bridge deck were included as part of the review. Observed deflections correlated well to those predicted by the structural analysis and the work was executed without incident.